Wallpaper Sky is a free Windows 8 wallpaper app, that lets you view unlimited stunning wallpapers of high quality and download or set them as your PC’s Lock Screen image. It also lets you upload wallpaper images from your hard disk to its server. In place of just being a simple wallpaper downloader and uploader, it’s more than that because you can also play a slideshow of all the wallpaper images under a particular category, set a wallpaper as the background image of the app or profile picture, take a preview of how the lock screen will look before confirming everything, search for a picture using Search Charm, share wallpaper images you like with your friends using the Windows Share Charm, or even change settings of the app using Settings Charm. 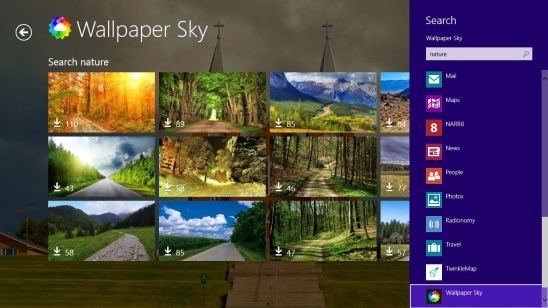 You can get this Windows 8 wallpaper app in the Entertainment Category in Windows Store. Or use Search Charm (Win+ Q) to find the app. This free Windows 8 wallpaper app is a great source from where you can browse and download thousands of amazing high quality wallpapers for free. The photos are uploaded by the users of the app, plus you can get most breathtaking wallpapers which are selected by Flickr, the wallpapers gets refreshed on regular basis. The time you open the app, you’ll get the Main Screen which contains lot of wallpapers in tile view under their respective categories. Still the interface is quite clean and smooth. The User Showroom contains wallpaper images which are uploaded by app users and chosen by app’s editors, Collection consists of subcategories which contains a group of wallpapers under their respective type. Flickr contains wallpaper images from the Flickr database. 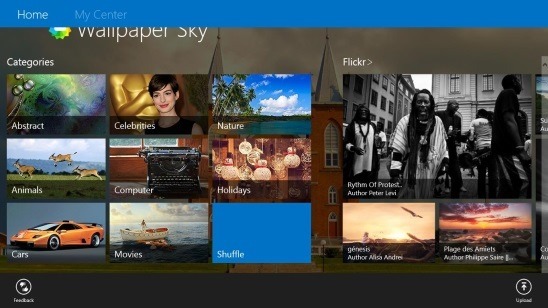 The purpose of this free Windows 8 wallpaper app is simple and straight, and it does what it advertises. The design of the app’s interface is stylish and creative. Navigation between screens is easy. The categories help in finding wallpapers quickly and easily. Results are shown instantly when you make a search for a wallpaper, which you can filter further by Wallpaper Sky cloud or Flickr database. You can get the aforementioned options (downloading a wallpaper, setting it as Lock Screen image or app’s background image, adding wallpaper to favorites, viewing picture information, and playing a slide show) simply by one single mouse click. All you have to do is to open the wallpaper image and make a right-click; this shows a flyout at the bottom of the screen containing buttons for each option. Good for being a Windows 8 wallpaper app. Huge collection of stunning high quality wallpapers. Daily featured wallpapers from Flickr. Browse wallpapers using Search Charm and download them or set them as the Lock Screen Image. My Center option helps you easily manage the uploads, downloads, and favorites made by you. Lock screen show option, which changes the Lock Screen image based on the time interval set by you. Good UI with image tiles arranged in a right manner. Follows a screenshot of Lock Screen Show Settings which can be opened through Settings Charm (WIN + I) within the app. Wallpaper Sky is a nice app to try your hands on, and customize the Lock Screen with high quality stunning free wallpapers. 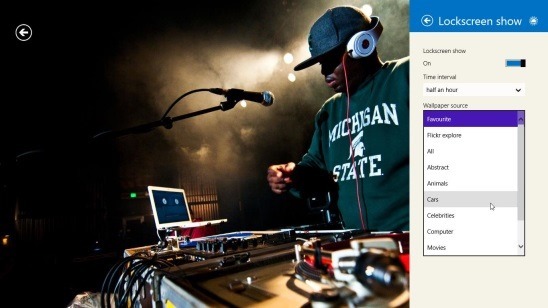 The features make it a good app for being a Windows 8 wallpaper app. Above all, it’s totally free!